Ezekiel is an interesting person. He was both a prophet and a priest. He was also taken away with the first group of Israelites into exile. He shares a positive and hopeful message to his people. God will turn this situation around. Name a difficult struggle you experience in your life. Can you see a slow transformation and wisdom in the midst of your suffering? What does the deep voice of the spirit invite you to do so you can ‘rise from your grave’? St Paul uses the word ‘flesh’ (sarx) to mean people who have a self-centred orientation towards the world. Frequently those who live this way make themselves, their senses and pleasure, their ‘idol’ / god. Those who live directed by the spirit of Christ are turned outward in love and ‘self-lessness’. Ponder the powerful bodily image of arms wrapped around yourself tightly, or arms open and outstretched in embrace of the world. How do you live your life? How is your almsgiving this lent? In the Gospel of John Jesus performs 7 signs. Each sign is a fulfillment of a Messianic hope from the Old Testament. Each sign reveals the presence of God in Jesus. Today is the 7th and most important sign. Jesus overcomes death. And only God can overcome death! Place yourself in this gospel story. If you were really there in this scene what questions would you ask? What would you believe from this experience? Martha’s questions reveal a growing knowledge of who Jesus really is. She begins with Jesus as someone close to God – “whatever you ask, God will give to you.” Jesus responds to Mary’s belief in the resurrection on the last day with a powerful statement: Mary, the one who is in charge of the resurrection is looking at you! I AM the resurrection and the life. And to prove it, Jesus raises Lazarus. What does Jesus wish to reveal to Mary? Do you see the ‘sign’ and believe what it is pointing to? The Rabbi’s believed and taught that the spirit and breath of life hovered around a dead body for three days. Waiting for 4 days can be understood as Jesus ensuring everyone knew Lazarus had truly died. Twice Jesus is ‘perturbed’ or angry that someone he loves has been tied hand and foot and buried. (A symbol of what sin and death can do to us.) Untie him and let him go becomes a fulfillment of Ezekiel’s promise (1st reading) and an image of what Jesus can do personally for each disciple. What tomb am I in? What cloths bind me up? Who might God be using to ‘take away the stone’ blocking me from joy and life? 5th Sunday Lent Yr A – Who are you Jesus? Rising from the dead is an image in the First and Gospel readings. Ezekiel was not referring to the resurrection of individuals but returning from exile in ‘slavery’ and God’s people trapped in a ‘foreign land’. As the journey of Lent nears completion we are encouraged to celebrate the sacrament of reconciliation. We invite the spirit to ‘open our graves’ and ‘rise from them’. Where do you experience ‘lifelessness’? Sadness? Dryness? Death? Ezekiel paints pictures of what our life and history is really like. He writes of suffering as tough meat being boiled to tenderness in a pot and the heat of fire burning off the rust on the pot (Ez 24). In the midst of suffering Ezekiel writes 86 times ‘I am the LORD’ reminding us that God is guiding our personal lives and history. Can you trust God can work through your suffering? While we all live as ‘flesh and blood’ St Paul recognises it is possible for our ‘body / flesh’ to steer our life seeking only to satisfy itself with food and pleasure. Selfish and sensual living (flesh living) alone does not ‘please God’. Our baptism welcomed into our lives the Spirit of Christ which inspires and nudges us to become more like Christ. Consider the great power of the spirit to raise Christ from the dead. What would you like to pray for? Chapter 11 of John is very special. Raising Lazarus from the dead is the seventh ‘sign’ of Jesus. It is important to recognise a sign points to a reality. Jesus, on hearing of his friends death strangely talks immediately of ‘glory’. He even waits for four days as the Jewish belief was that the spirit of the body hovered over the body for 3 days. It is clear Lazarus is truly dead. Only God can bring someone back from the dead. This will be Jesus’ greatest sign to prove his identity as God. If you were present to this scene what would your questions be? Martha and Mary ask questions and respond to Jesus like a true Jewish disciple and faith seeker. Jesus is considered as an intermediary, someone ‘close to God’ ‘whatever you ask of God God will give you’. Jesus is unhappy with this response. Martha responds with a Jewish belief in the final resurrection from the dead and a hope in the Messiah. Jesus boldly proclaims ‘Martha, I AM the resurrection and the life’. In effect Jesus is teaching Martha (and us) I am God and I am in charge of and responsible for the resurrection and all life! Let me prove this to you ‘where have you laid him’? Can you trace your faith journey about Jesus’ identity in the questions of Martha? What does this 7th sign now teach you about Jesus? Do you believe? The Gospel of John was written in Greek. Greek thinking did not allow God to ‘change’ as this would suggest God was weak and not all-powerful. In the midst of his loved friends we have the profound short sentence. ‘And Jesus wept.’ God weeps and is deeply moved by our pain and sadness. Jesus is also perturbed and troubled. John stirs questions up for us about God. If God weeps what does that mean? 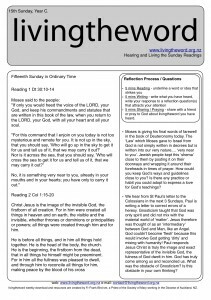 Is Jesus upset and angry that people do not recognise who he is? What is your response personally to Jesus in this Gospel story? 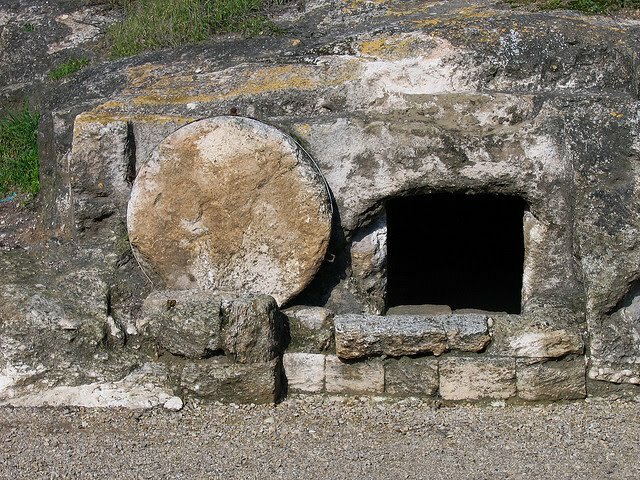 Jesus strangely says a prayer of thanksgiving before the tomb. Can you allow yourself to hear this prayer to you in the tomb of your wounds and bandages from your life journey. What do you request this Easter to be untied from?